On September 3, 2015, many Republicans heaved sighs of relief when Donald Trump signed a pledge saying he’d support the GOP nominee for president instead of entertaining a third-party candidacy. In order to secure that pledge, all of the other candidates signed it, too, which wasn’t surprising since everyone but Trump had promised to support the nominee during the very first candidate debate. Trump was pretty clear that he’d honor the pledge so long as the GOP treated him “fairly,” which most obviously meant he’d have firm party support if he did win the nomination (still not something many Republicans seriously thought possible last September). And at nearly every subsequent Republican debate some candidate would ritualistically opine that every one of them would be a better president than the godless socialists running for the Democratic nomination — and nobody publicly dissented. Rubio and his aides have been promoting a #NeverTrump campaign on Twitter. Independent or third-party candidacies aside, it’s very, very rare for major presidential candidates who lose nomination contests to refuse to endorse the winner. The only two I can think of are Nelson Rockefeller, who never got around to endorsing Barry Goldwater in 1964, and George Wallace, whose recovery from an assassination attempt protected him from recriminations for failing to provide what would have been a very unlikely endorsement to George McGovern in 1972. Hmmm. Barry Goldwater and George McGovern … what is it they have in common? Yes, this could be a pretty significant moment in this most agonizing of presidential cycles for the GOP. Perhaps cynics expect Trump and Rubio to kiss and make up when the dust has settled and raise hands together in Cleveland. 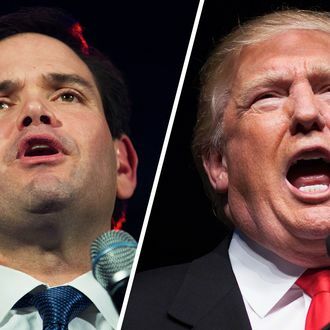 But it’s reasonably clear that Rubio has decided not to let Republicans off the hook by professing neutrality in the presidential race, and that he’s more than willing to counter Trump’s threats to a united party in November with his own.